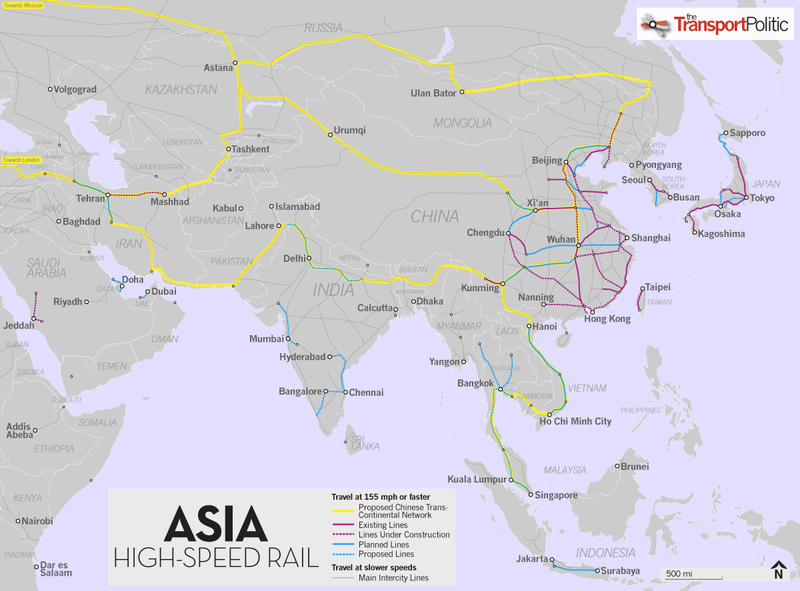 There are lots of developments underway in improving trans-Eurasian raillinks between China and Europe. Three such links are discussed in the article. Engdahl, who abandoned his peak-oil beliefs a few years ago, is optimistic about the prospects of Eurasian trade: “The prospect of an unparalleled Eurasian economic boom lasting into the next Century and beyond is at hand“. That is too optimistic in our view. A raft of new offshore wind farms and hydroelectric power plants are in the offing, after German energy companies and investors yesterday confirmed they are preparing to plough up to €60bn into overhauling the country’s power infrastructure, following the government’s pledge to phase out nuclear reactors… plans are underway to build or modernise 84 power stations with a combined capacity of 42GW… Confirmation that 23 offshore wind projects and 10 hydro pumped storage projects are being planned… the report also reveals that energy firms are planning 29 gas-fired power plants and a further 17 coal-fired facilities. The world is a complicated place and often it is difficult to make sense of it. 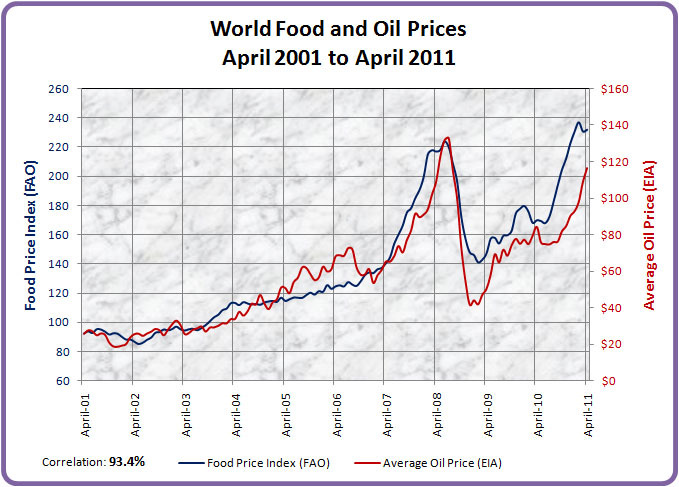 Here at least is a piece of knowledge that is easy to remember, namely that oil and food prices are strongly correlated (93.4%). And that there hardly is a time lag between them. And that the poorest are going to be hurt if fossil fuel prices will continue to climb, as they likely will. [Tegenlicht] – Dutch documentairy about Gasland, applied to Europe. Lots of spoken English. 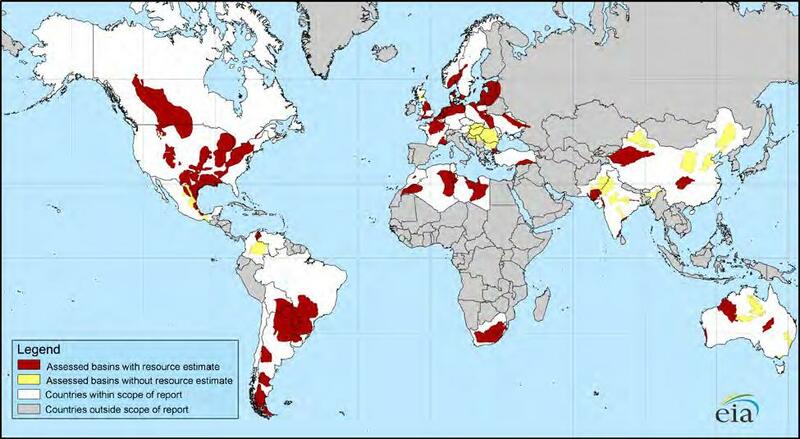 World map showing potential for shale natural gas. The EIA says China has 36 trillion cubic meters of shale gas. Assuming that the caloric value of 1 m3 of natural gas is roughly equal to that of 1 liter of oil, this amount of gas is equivalent with 226 barrels of oil. 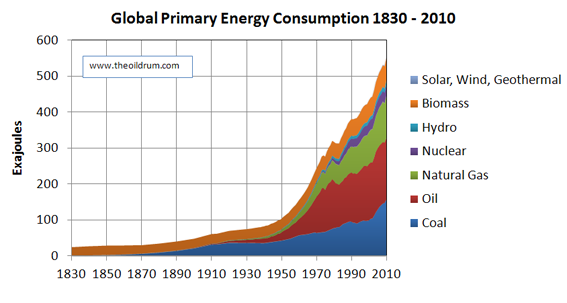 In 2010 China consumed 10 million of barrel of oil a day. Further assuming an EROI of shale gas of 70, this would mean that China’s shale gas reserves do represent an oil equivalent of 60 years of present day chinese consumption. That’s good news for China and we have to admit we are surprised. Dejima and Nagasaki Bay, circa 1820. Two Dutch ships and numerous Chinese trading junks are depicted. Kunstler in his yesterday column writes: “all of which points to the likelihood that Japan will become the first advanced industrial nation to bid sayonara to modernity and return to a neo-medieval socio-economic model of daily life.” Kunstler has earlier acknowledged that the days of globalism are over in the long run in the light of resource depletion, first and foremost oil. It is ironic that it had been the US that in 1854 under commodore Matthew Perry had forced Japan to open up for world trade. Before that Japan always had been a closed, read nationalist society, that did not need combustion engines to keep it’s society going. The only contact Japan had with the West up until 1854 was with the Dutch on the small island of Desima. Water has 1000 times the density of air. 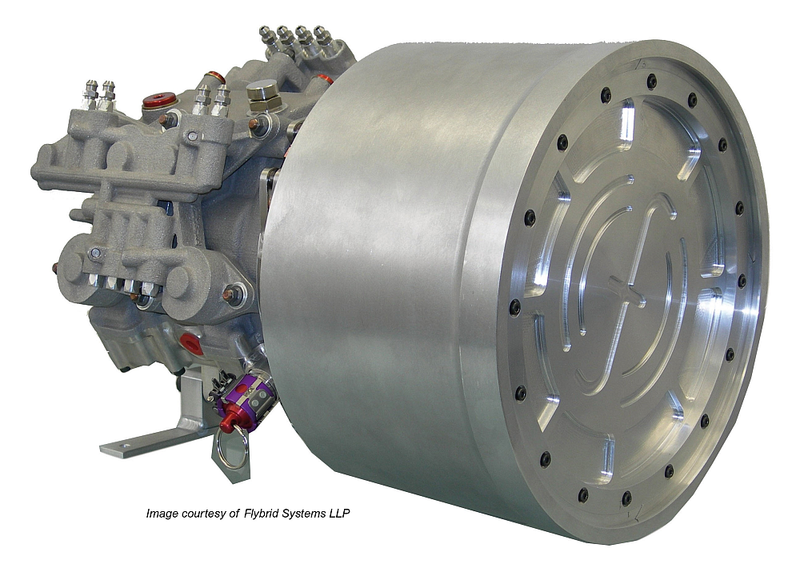 This means that with equal flow and rotor area the generated power for water turbines is 1000 times higher than for wind turbines. 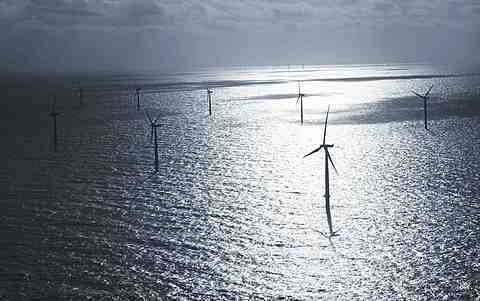 There is a lot of potential for power generation in the stormy waters that surround the British Isles. We predict that Britain once might rule the waves again. This time not with an imperial fleet in an unsatiable quest for new imperial territory (25% of the planet in 1920), but rather scraping the last few hundreds of megawatts from the bottom of the energy barrel. 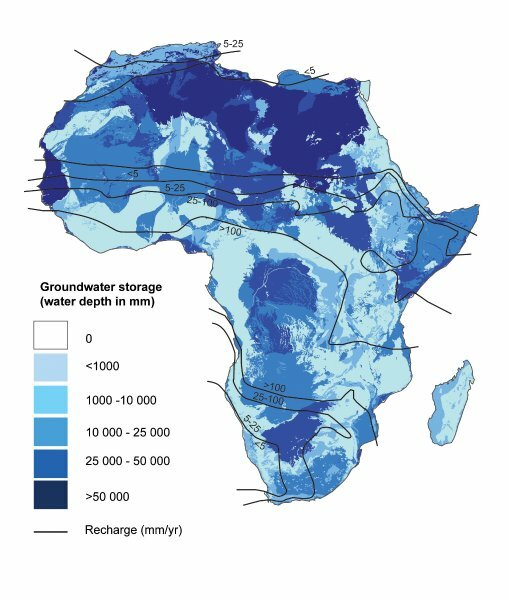 Researchers from the British Geological Survey and University College London (UCL) have mapped in detail the amount and potential yield of this groundwater resource across the continent. Greatest ground water storage is in northern Africa, in the large sedimentary basins, in Libya, Algeria and Chad. The amount of storage in those basins is equivalent to 75m thickness of water across that area, which is huge… With careful exploring and construction, there is sufficient groundwater under Africa to support low yielding water supplies for drinking and community irrigation…This research… could have a profound effect on some of the world’s poorest people, helping them become less vulnerable to drought and to adapt to the impact of climate change. * map shows amount of water present in aquifers. One of the, no doubt unintended, consequences of the US intervention in Iraq is that the country de facto has been handed over to the Iranian sphere of influence. Saddam was a dictator whose powerbase was rooted in the 18% Sunni minority. Installing democracy in an essentially tribal world, means that a country is going to be taken over by the largest tribe, and in case of Iraq that is the Shia majority of ca. 63%. 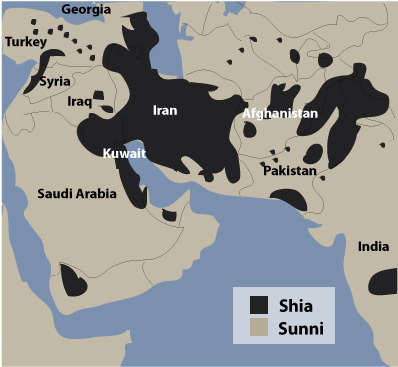 And although the Shia flavor of Islam represents a minority, fate decided that most of the oil rich areas happens to be populated by Shia. Mind you: populated, not controlled. Not yet. Well, Iran and Iraq are, but Saudi-Arabia is Sunni controlled and does not like at all to see the rise of the Shia. 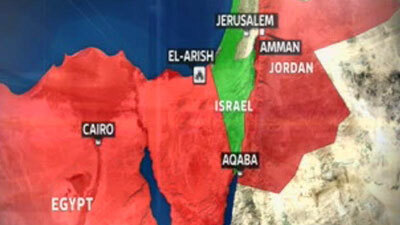 To make matters worse, much of the Saudi territory that harbors the oilfields is Shia populated. Pilot project involving 6 buses. Expected fuel savings up to 30%. If successfull, implementation on all 4,000 companies fleet buses could be considered. In essence, rather than wasting kinetic energy as heat in breaks, it is transformed in kinetic energy of a rotating flywheel (‘mechanical battery as it were’). This energy again is used to bring a bus up to speed from standstil and thus the bus engine saves fuel. Return on investment with current high fuel prices estimated to be five years. Donald Sadoway is working on a battery miracle — an inexpensive, incredibly efficient, three-layered battery using “liquid metal.” 2MWh batteries are under construction. 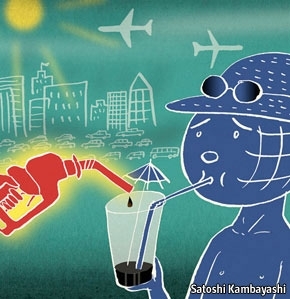 The world is about to run out of cheap oil and change dramatically. Within the next few years, global production will peak. 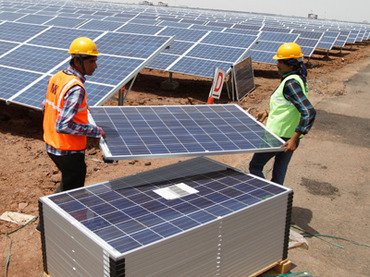 Thereafter, even if industrial societies begin to switch to alternative energy sources, they will have less net energy each year to do all the work essential to the survival of complex societies. We are entering a new era, as different from the industrial era as the latter was from medieval times. 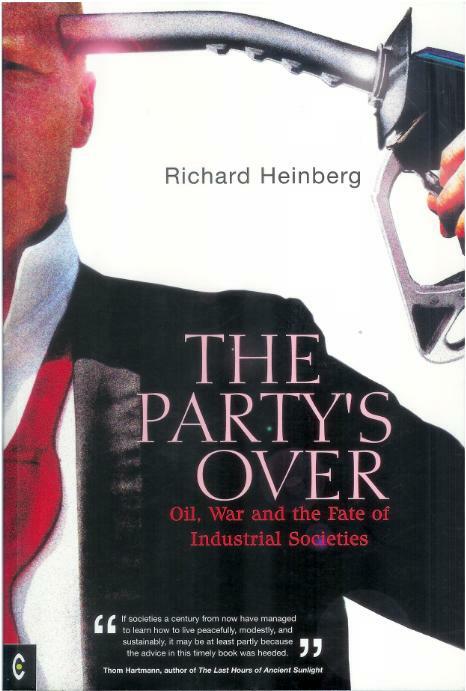 In The Party’s Over, Richard Heinberg places this momentous transition in historical context, showing how industrialism arose from the harnessing of fossil fuels, how competition to control access to oil shaped the geopolitics of the twentieth century and how contention for dwindling energy resources in the twenty-first century will lead to resource wars in the Middle East, Central Asia and South America. He describes the likely impacts of oil depletion and all of the energy alternatives. Predicting chaos unless the United States—the world’s foremost oil consumer—is willing to join with other countries to implement a global program of resource conservation and sharing, he also recommends a “managed collapse” that might make way for a slower-paced, low-energy, sustainable society in the future. Updated for the second time since 1992, this book, by a trio of professors and systems analysts, offers a pessimistic view of the natural resources available for the world’s population. Using extensive computer models based on population, food production, pollution and other data, the authors demonstrate why the world is in a potentially dangerous “overshoot” situation. Put simply, overshoot means people have been steadily using up more of the Earth’s resources without replenishing its supplies. 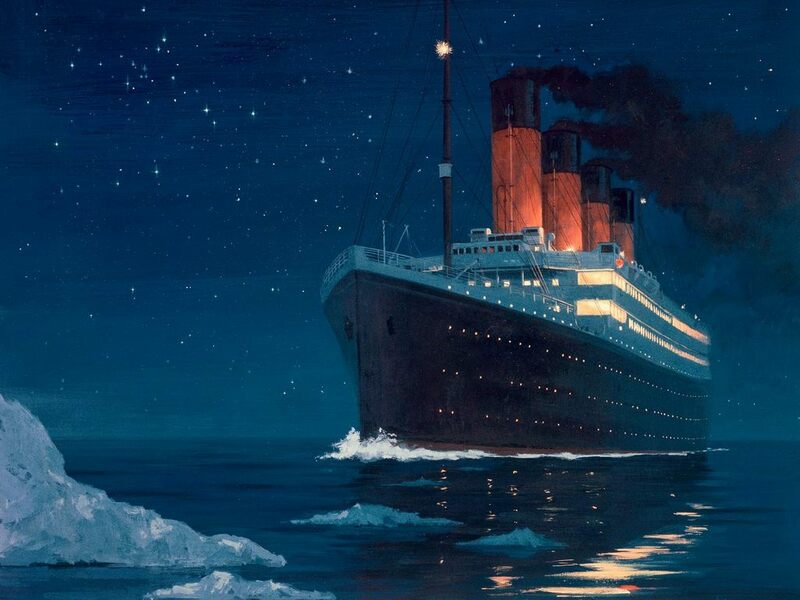 The consequences, according to the authors, may be catastrophic: “We… believe that if a profound correction is not made soon, a crash of some sort is certain. 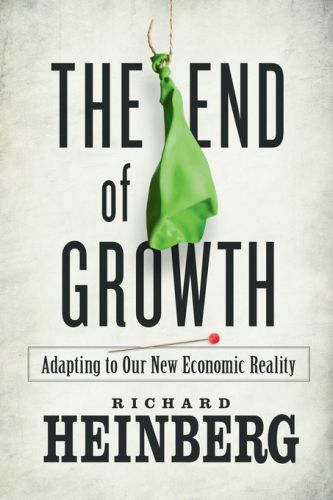 And it will occur within the lifetimes of many who are alive today.” After explaining overshoot, the book discusses population and industrial growth, the limits on available resources, pollution, technology and, importantly, ways to avoid overshoot. 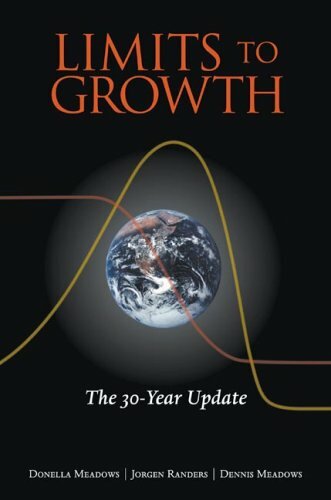 The authors do an excellent job of summarizing their extensive research with clear writing and helpful charts illustrating trends in food consumption, population increases, grain production, etc., in a serious tome likely to appeal to environmentalists, government employees and public policy experts. This book is a gripping account of the murky world of the international oil industry and its role in world politics. Scandals about oil are familiar to most of us. From George W. Bush’s election victory to the wars in Iraq and Afghanistan, US politics and oil enjoy a controversially close relationship. The US economy relies upon the cheap and unlimited supply of this single fuel. 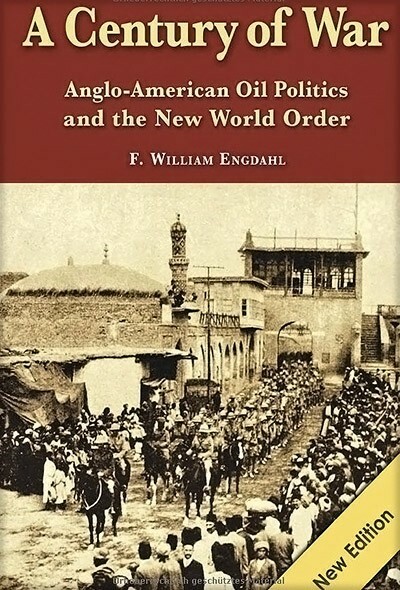 William Engdahl takes the reader through a history of the oil industry’s grip on the world economy. His revelations are startling.